Say it with words. 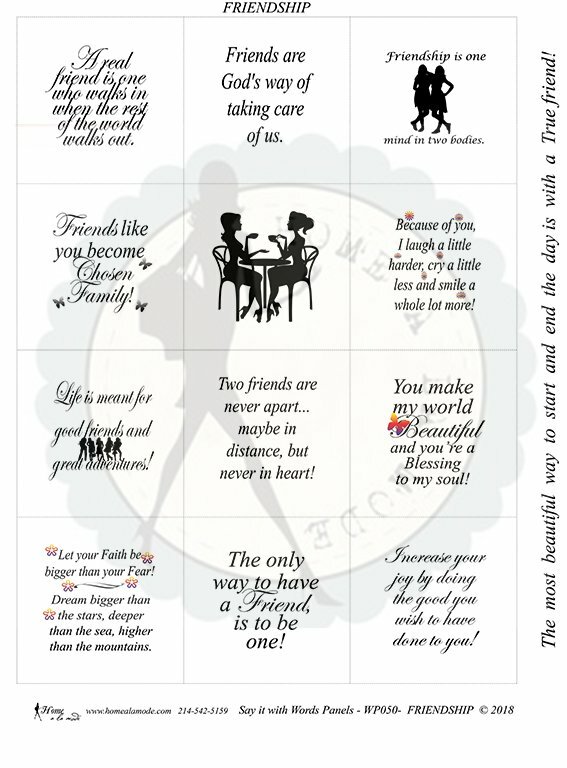 Friendship is a Home a la mode word panel that is all about the serious side of our feelings and the fun SIDE for a great Friend... like: A real friend is one who walks in when the rest of the world walks out. Friends are God's way of taking care of us. Friendship is one mind in two bodies. Friends like you become Chosen Family! Because of you, I laugh a little harder, cry a little less and smile a whole lot more! Life is meant for good friends and great adventures! Two friends are never apart... maybe in distance, but never in heart! You make my world Beautiful and you’re a Blessing to my soul! Let your Faith be bigger than your Fear! Dream bigger than the stars, deeper than the sea, higher than the mountains. The only way to have a Friend, is to be one! Increase your joy by doing the good you wish to have done to you! The most beautiful way to start and end the day is with a True friend!